We present the case of a 55-year-old patient with an incidental finding of an anterior communicating artery (AcomA) aneurysm treated with X-stent-assisted coil occlusion with good angiographic and clinical follow-up. AcomA aneurysms are responsible for about 40% of all aneurysmatic subarachnoid hemorrhages (SAH). When treated with coil occlusion only, these aneurysms have high initial occlusion rates, but as well they show high recanalization rates. The endovascular reconstruction of the parent vessel with a stent provides support for the coil cast which avoids coil protrusion and improves initial occlusion. The use of more than one stent to secure complete neck coverage is a common practice and depends on the anatomic configuration of the AcomA complex including the vessel diameter of both A1 segments of the ACA and the portion of the AcomA affected by the aneurysm neck. 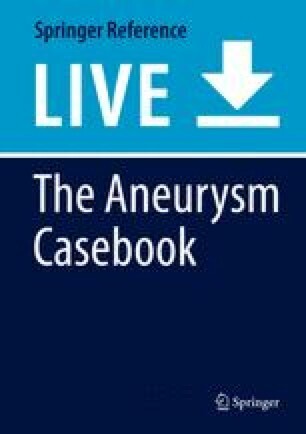 The stent-assisted coil treatment of unruptured AcomA aneurysms is the main topic of this chapter. Anterior communicating artery X-configured stent-assisted coil occlusion Dual antiplatelet medication LVIS Jr.